The world famous Osho Tree is located at the Bhanvartal garden in Jabalpur. Here is the Maulshree Tree under which Osho got enlightened. The world renowned Osho (Bhagwan Shree Rajneesh) was only 21 years old when he got the enlightenment. According to him when he entered the Bhanvartal garden very late one night, everything became luminous. One tree was tremendously luminous, it was the maulshree tree. He went and sat under the tree and then things began to settle. 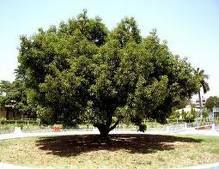 It is under this very Maulshree tree that he received the message and blessings of God and thus achieved enlightenment. This Maulshree tree is preserved with great care even today in the Bhanvartal garden and is popularly called as the "Osho Tree". This tree is of great significance to the followers of Osho all round the globe.